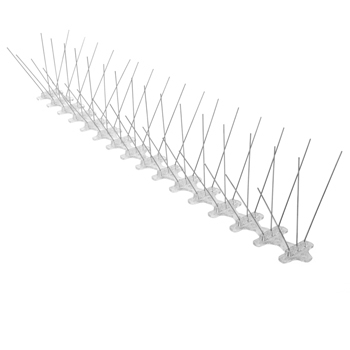 Protect your property from dangerous and unsightly bird droppings with Bird-B-Gone Bird Spikes. Bird Spikes are an effective and humane way to keep birds such as pigeons, crows and seagulls from landing on window sills, ledges, rooflines, under eaves, and more. Bird-B-Gone spikes are virtually invisible and come pre-assembled in 2 foot sections and provide 7 inches of coverage. The spikes are easy to install with glue or screws. Stainless Steel Bird Spikes from Bird-B-Gone are made with a U.V. protected polycarbonate base with stainless steel pins and carry an industry leading 10 year guarantee. The polycarbonate base is very flexible and can be mounted to most surfaces.